She's every lover's feisty girlfriend. She's every father's courageous daughter. She's every woman's tough, vulnerable, and spirited alter ego. She's Kinsey Millhone, familiar to millions of readers around the globe, and she's back in full stride in P is for Peril, her latest venture into the darker side of the human soul. Mordant, mocking, and deceptively low-key, hers is a voice we know we can trust, from a character we've come to love. Through fifteen novels, Sue Grafton has gone from strength to strength, never writing the same book twice. So it's no surprise that she has taken on new territory in her sixteenth, this time entering the world of noir. It's a world cast in shades of black amid shafts of steel and silver, a shadow land in which the mysterious disappearance of a prominent physician leads Kinsey into a danger-filled maze of duplicity and double-dealing as she taps into the intricacies of a cunning Medicare fraud. P is for Peril: the novel in which Millhone stakes her life on a thin thread of intuition because the facts glint elusively out of reach and only guesses offer any shot at the truth. 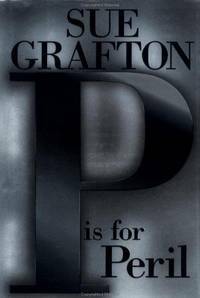 "Unlike many detective series, Grafton's seems only to get better each time out," wrote Entertainment Weekly, and P is for Peril is a case in point. Pushing herself, reaching further with each new book, Sue Grafton delivers every time. 2017-07-25. New. Ships with Tracking Number! INTERNATIONAL WORLDWIDE Shipping available. Buy with confidence, excellent customer service! Random. Audiobook CASSETTE. B000PAK6M2 UNABRIDGED 8 cassette set with original box. Box has wear, tapes look fine. We are FAST!! Check our feedback! Ships next day in padded envelope with barcoded address, delivery confirmation, and tracking number. . Very Good. Ballantine Books. Paperback. 0449007332 Please allow 4 - 14 business days for Standard shipping, within the US. Thank you for supporting our small, family-owned business! . New. 2002-01-01. First Printing. Ballantine Books. Paperback. 0449007332 Please allow 4 - 14 business days for Standard shipping, within the US. Thank you for supporting our small, family-owned business! . Fine. 2002-01-01. First Printing. 2001-09-04. Good. Ships with Tracking Number! INTERNATIONAL WORLDWIDE Shipping available. May not contain Access Codes or Supplements. May be ex-library. Shipping & Handling by region. Buy with confidence, excellent customer service! Marian Wood Books/Putnam. Used - Very Good. Very Good condition. Very Good dust jacket. Owner's name on endpage. 2001-03-08. New. Ships with Tracking Number! INTERNATIONAL WORLDWIDE Shipping available. Buy with confidence, excellent customer service! Thorndike Press, 2001-08-01. Hardcover. Used:Good. New York: A Marian Wood Book / G. P. Putnam's Sons. Fine in Near Fine dust jacket. 2001. First Edition; First Printing; Signed by Author. 1/4 Cloth. 0399147195 . An attractive first edition/first printing in Fine condition in About Fine dust-jacket with light edgewear. SIGNED by author Sue Grafton directly on the title page; Dr. Purcell has been missing for nine weeks. Kinsey Millhone had followed the disappearance in the newspapers and then his former wife sought her services. He was the director of a care facility. Millhones latest venture into the darker side of the human soul; A Kinsey Millhone Mystery . New York: G. P. Putnam's Sons. As New in As New dust jacket. 2001. First Edition; First Printing; Signed by Author. Hardcover. 0399147195 . A stunning first edition, first printing in As New condition in As New dust jacket, SIGNED by author Sue Grafton directly on the title page; Dr. Purcell has been missing for nine weeks. Kinsey Millhone had followed the disappearance in the newspapers and then his former wife sought her services. He was the director of a care facility. Millhones latest venture into the darker side of the human soul. Obtain the complete Alphabet Series, signed 1st/1st in Fine condition with completion guarantee at a 20% reduced price compared to individual titles . 2001-08-04. Good. Ships with Tracking Number! INTERNATIONAL WORLDWIDE Shipping available. May not contain Access Codes or Supplements. May be ex-library. Shipping & Handling by region. Buy with confidence, excellent customer service! Ballantine Books, 2002-01-01. Paperback. Used:Good. New York: G. P. Putnam, 2001. First Edition. Hard Cover with Dust Jacket. Fine/Fine. Octavo. SIGNED AND INSCRIBED BY SUE GRAFTON ON TITLE PAGE. Inscribed to bookseller Charles Parkhurst and his wife Sandy. First printing. A Fine copy in a Fine Dust Jacket. 352 pp. NY: PUTNAM.. Fine in Fine dust jacket. 2001. First Edition; First Printing. Hardcover. 0333741463 . First edition. SIGNED by Sue Grafton on title page. Fine in fine dust jacket. Kinsey Millhone. .
G.P. Putnam's Sons, 2001 Published in New York by G.P. Putnam's Sons in 2001. First Edition indicated on copyright page with number sequence 1 3 5 7 9 10 8 6 4 2. Rare in this format, in wrappers with DJ attached. Book fine. DJ near fine. DJ price reads $26.95.. First Edition. Soft cover. Fine/Fine. New York: G. P. Putnam's Sons. Fine in Fine dust jacket. 2001. First Edition; First Printing; Signed by Author. Hardcover. 0399147195 . A handsome first edition/first printing in unread Fine condition with three creased pages. In Fine dust-jacket. Signed by author Sue Grafton directly on the title page; Dr. Purcell has been missing for nine weeks. Kinsey Millhone had followed the disappearance in the newspapers and then his former wife sought her services. He was the director of a care facility. Millhones latest venture into the darker side of the human soul. Obtain the complete Alphabet Series, signed 1st/1st in Fine condition with completion guarantee at a 20% reduced price compared to individual titles . Ballantine Books. Mass Market Paperback. 0449003795 Please allow 4 - 14 business days for Standard shipping, within the US. Thank you for supporting our small, family-owned business! . Fine. 2002-05-28. 1st. Ballantine Books. Mass Market Paperback. 0449003795 Please allow 4 - 14 business days for Standard shipping, within the US. Thank you for supporting our small, family-owned business! . New. 2002-05-28. 1st. New York: G. P. Putnam's Sons, 2001. SIGNED by the AUTHOR on the Title page. Signature only. A First edition, First printing. Book is in Fine condition. Boards are clean, not bumped. Fore edges are clean. Interior is clean and legible. Not remaindered. Dust Jacket is in Fine condition. Not chipped or crinkled. Not price clipped. Dust Jacket is covered by Mylar Brodart. Thanks and Enjoy. All-Ways well boxed, All-Ways fast service. Thanks.. Signed by Author. First Edition. Hard Cover. Fine/Fine. New York: G. P. Putnams Sons. Fine in Fine dust jacket. 2001. First Edition; First Printing. Hardcover. 0399147195 . An attractive first edition/first printing in Fine condition in alike dust-jacket; Dr. Purcell has been missing for nine weeks. Kinsey Millhone had followed the disappearance in the newspapers and then his former wife sought her services. He was the director of a care facility. Millhones latest venture into the darker side of the human soul . Putnam, 2001. SIGNED BY AUTHOR and Dated on title page. First Edition/First Printing. Fine condition. Brodart protected, ships in a box.. Signed by Author. First Edition. Hardcover. Fine/Fine. E Rutherford, New Jersey, U.S.A.: Putnam Pub Group, 2001. Hardcover. As New/As New. First Edition/First Printing 2001. A stunning first print copy in "As New" condition in an unclipped and "As New" dustjacket. This copy is signed and personalized on the title page. Opened only for the signature--unread as new copy. Part of the alphabet series with Kinsey Millhone as the investigator par excellence. Very collectible copy. Ballantine Books. MASS MARKET PAPERBACK. 0449003795 New Condition. . New. Putnam. Hardcover. 0399195548 New Condition. . New. Marian Wood Books/Putnam. Hardcover. 0399147195 New Condition. . New. Pan Books. PAPERBACK. 0330371967 New Condition. . New. Ballantine Books, 2002-05-28. Mass Market Paperback. Used:Good. New York: Putnam. 2001. First Edition. Signed by Author Very fine in dust jacket. .
Marian Wood Books/Putnam. Hardcover. 0399147195 This hardcover book is square and tight. The boards and spine have no wear with pristine gilt. The pages and endpages are clean, with no markings or folds. The dustjacket is As New. Original Price is intact. Not ex-lib. No remainder mark. Signed by the Author on the title page without inscription. . Fine. 2001. First Edition. 2001-03-08. Good. Ships with Tracking Number! INTERNATIONAL WORLDWIDE Shipping available. May not contain Access Codes or Supplements. May be ex-library. Shipping & Handling by region. Buy with confidence, excellent customer service! New York: G.P. Putnam's Sons, 2001. 10/23/2009. Fine/Fine. First edition. Fine in fine dustwrapper. Signed by the author. Included are two Christmas cards, each with a photo of the author and each signed "Sue"
[S]he soon finds herself in a dangerous shadow land, where duplicity and double-dealing are the reality and, with the truth glinting elusively out of reach, she must stake her life on a thin thread of intuition.". Signed by the Author (her signature only). First Printing of the First Edition. Hardcover. New/New. Illus. by Tafuri, Thomas (jacket design). 8vo. (xii), 352pp. Great Packaging, Fast Shipping. New York: G.P. Putnam's Sons, 2001. Hardcover. Small 4to. Black cloth spine and grey paper over boards, dust jacket. 352pp. Near fine/very good. Tight, quite attractive first edition, signed handsomely by Grafton in black fineline on an inner flyleaf. G P Putnam, 2001. Book. Fine. Hardcover. Signed by Author(s). 1ST. Signed By The Author On The Title Page. Signature Only. A First Edition, First Printing. Book Is In Fine Condition. Boards Are Clean, Not Bumped. Fore Edges Are Clean. Interior Is Clean And Legible. Not Remaindered. Dust Jacket Is In Fine Condition. Not Chipped Or Crinkled. Not Price Clipped. Dust Jacket Is Covered By Mylar Brodart. Thanks And Enjoy..
New York, New York: A Marian Wood Book / G. P. Putnam's Sons, 2001. Fine. Signed on title page.. Signed by Author. First Edition, 1st Printing. Hard Cover. As New/As New.